A rare and unusual pair of Tomb pottery figures of horses, Chinese, dating to the Ming Dynasty 1368-1644 AD. The figures are very cute and attractive and finely glaced with good details. The glace in white and brown and bright green for the details of manes, tails etc. 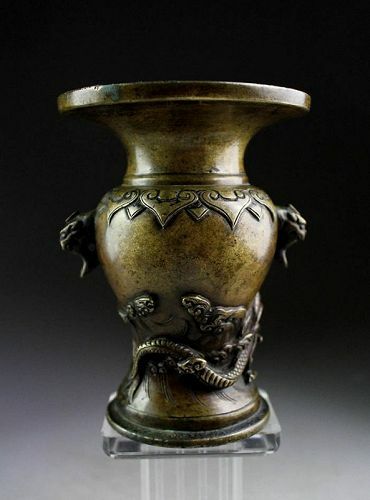 An ornate Incense Burner with two fighting Dragons, Ming Dynasty 168-1644 AD. the vessel stands on three stout legs decorated with animal heads. The glacing in dark blue and torquise colours. 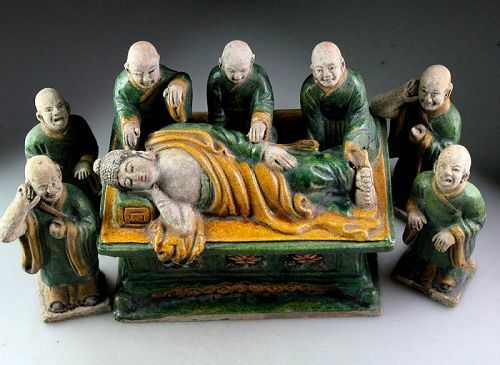 An extremely rare and interesting figural group of the Dying Buddha, Chinese Ming Dynasty (1368-1644) Tomb pottery, dating to the 15th.-16th. century AD. 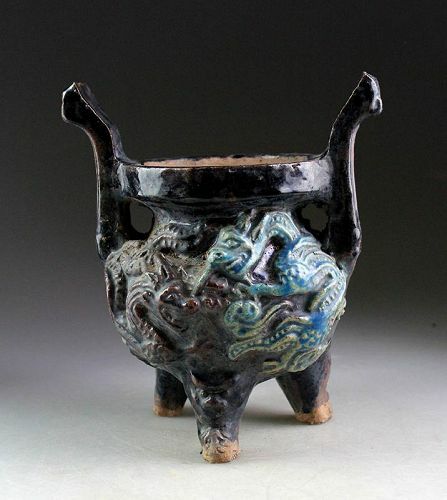 A rare and stunning Zhadou vessel, dating to the late Ming Dynasty, 17th. century. 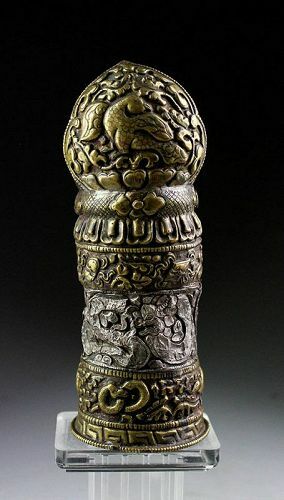 The vessel, known as a Zhadou or Leys Jarin, has it's characteristic shape and knob handles shaped as Lion heads and decorated with a Dragon and other ornaments. The piece was made using a white bronze alloy, very well made in the finest style, precise and sharp. 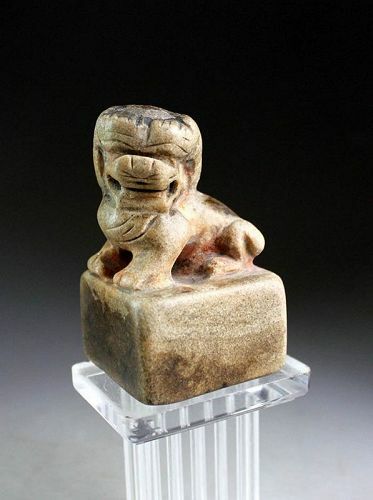 A very rare Chinese monastery stone seal, Late Sung-Yuan Dynasty, 12th.-13th. century AD. Exceptional seal, used in a Tibetan monastery while Europe was medieval. A large seal carved in a beige brown stone, in the typical style of the period, inscribed on the seal itself. Size: 9 cm. tall and 5,3 cm. in diameter. Choice antique India bronze figure of Ganesha Dancing on a Rat! 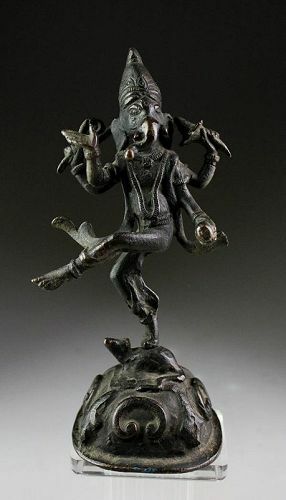 A very choice bronze figure of Ganesha Dancing on a Rat, 19th or earlier. He is mounted on a round plint upon which the Rat is seated and wearing a tall headdress, jewels and holding his attributes. A nice figure with a wonderful thick brown brass patina. An exceptionak bronze figure of Buddha with dark green patina, Thailand, 16th/17th century. 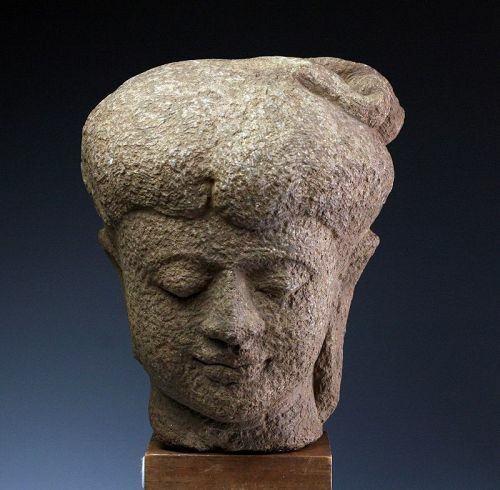 Walking Buddha figure is mounted on to a fine square darkwood base. He is dressed in a simple monk's robe kasaya. The left hand is raised to the vitarka mudra, hes right hold a round bowl. Serene, meditative expression with a lowered view to the ground, helical-shaped curls and a flame shapes ketumala. Rare huge Sino-Tibetan bronze and silver stamp seal, ca. 18th. cent. By far the largest antique Sino-Tibetan seal we've handled and very old, Qing Dynasty, 18th. century. A beautiful tall seal in seperate sections, done in bronze and foliage silver with the engraved seal plate done in iron. The entire surface done with floral and symethric foliage engravings, with two birds at the top (handle) and with a snake and 4-legged animals at the bottom. Pierced horisontically. Large and superb 19th. century Japanese Netsuke carving! A very accomplished Japanese carving of a Netsuke showing an old bearded man with staff and a Fan standing, at his feet a boy seated, 19th. century. Fine style and detailed in a good condition material. Size: ca. 5 cm. tall and 4 cm. wide. Provenance: Comes with our COA, and out of an important Old Collection, many pieces aquired and Christies and Sotheby's auctions. A scarce Japanese Netsuke, early 19th. century. Done in a fine style in Marine Ivory, perhaps Norval tusk, depicting a man with a large sack and a hammer. Very finely deorated on all surfaces and great polishing. Condition: Superb, very smooth even wear, wonderful patina. Provenance: Very old Private Collection, comes with our COA, most pieces bought at british auctionhouses, like Sotheby's and Christies. Fine 18th. century Japanese carved Netsuke of man with dog! A rare Japanese Netsuke, 18th. century. Done in a superb style, depicting an old bearded man stading beside a dog on a sort of double box. Typically, the earlier Netsukes were carved in left-over material from larger carvings, hence the often odd shapes. Size: ca. 38 mm. long, and 35 mm. wide over the base. Condition: Superb, fine even wear, beautiful patina. An Early Japanese Carving of a Netsuke, ca. 18th. century! A scarce Japanese Netsuke, ca. 18th. century. Done in a fine style, depicting a bald fat man inside a sack, triangular shape. Signed Antique Japanese Netsuke carving, 19th. century! A beautiful Japanese Netsuke, signed by the maker, 19th. century. Done in a fine style in ivory, depicting a man holding something big, signed on the bottom. Condition: Superb, fine even wear, wonderful orange patina.